1. Save money by investing in new handles on your cabinet doors, to give your kitchen a new look on a budget, or spring for all-new custom cabinets so that everything is designed to your specifications. 2. For a fresh new look, rip up that old flooring and install hardwood floors. From light wood to dark cherry, hardwood floors will make your room look bigger, and they’re durable and easy to maintain. 3. Your furniture is the center of attention, but buying all new things can be very pricey—so instead of buying a new couch or chair, repair, reupholster or refinish the one you have. 4. If you’re the type of person who has a lot of clutter, you may want to invest in a closet organizer. Get rid of your dressers and fit everything into your closet to allow more space for a television, night table or chair in the bedroom. This way you have more room in the bedroom and everything is neatly organized in one space. 5. Finished basements are a great plus for families with kids, giving them a place to hang out with their friends away from the main part of the house. Invest in comfortable carpeting and colorful paint for basement rooms, along with a television, couch and storage areas. 6. Love the house but hate the wallpaper? The easiest way to give your home a new look is a fresh coat of paint or bold new wallpaper. Your rooms can have a completely different look just by changing the color or picking out a new style of wallpaper. 7. One easy way to make your house green—and reduce your energy bills by hundreds of dollars—is to invest in high quality insulation. Many companies now offer more cost effective ways to insulate your house against winter chill and summer heat. 8. From valances to blinds, elegant floor-sweeping sheers to eco-friendly bamboo shades, there are hundreds of ways to make your windows stand out, and ensure your privacy at the same time. 9. A Jacuzzi bath tub can be a value-adding feature to your master bedroom. After a long day, it’s the just the thing to come home to. 10. A fireplace is always a great way to stay warm, while saving a little off the heat bill. If you’re sick of putting in the work, go with a gas fireplace. It’s easier and is a great addition to your room. 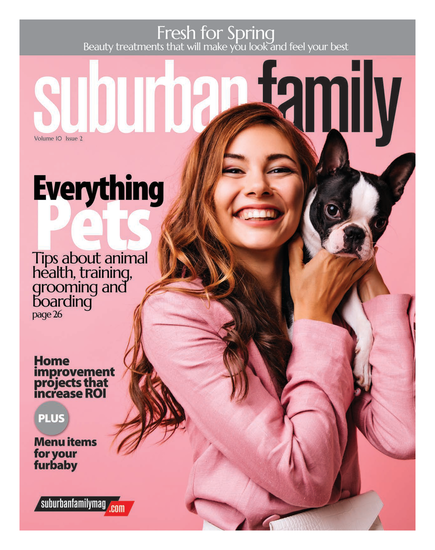 To find out where to pick up your copy of Suburban Family Magazine, click here. Here are 10 ways to make sure your garden and home exterior are ready to shine. 1. It’s a good idea to get your gutters cleaned once a year to avoid build-up of leaves and branches. Forget climbing that ladder yourself; a pro can take care of it easily (and injury free). 2. Part of the reason your new house was such a bargain was the color—cotton candy pink. Opt for an updated paint job to give the place a brand new look. 3. Landscaping is a huge plus for all homeowners—planting flowers and new trees, especially in the fall, will help your house stand out from the rest of the block. 4. Go big and add a pool or spa in your backyard. You’ll find yourself spending more time outside and hosting friends—not to mention adding a great deal of value to your property. 5. Is your driveway marred by scrapes and cracks? An easy repaving or repair job can make that old driveway as good as new within a few hours. 6. If you’re hoping to entertain outdoors, a stone patio, a wood deck or even an outdoor fireplace can transform your backyard into the life of the party. 7. Keep your trees healthy and groomed by hiring a tree service. Don’t leave dangerous and unwanted tree branches to fall and potentially cause damage. 8. To give your house more privacy, invest in a fence. Whether it’s wood, vinyl or wrought iron, the fence will enclose your house and give your kids a safe enclosed area to play in. 9. Love the outdoors? A front porch is a great addition to the look of your house and perfect for those fall days when your kids are playing in the front yard. 10. Spruce up the look of your house by adding lights to your landscape. In addition to making your property safer at night, lights add drama, make your yard look more appealing and add value to the house. More tips and resources for new homeowners can be found online at SuburbanFamilyMag.com.